Year of Our Lord 1634. The humans, ever hungry for new conquests, have invaded the lands of Hell, battling against the demonic forces in the catacombs deep under the city of New Jerusalem. Deep in the heart of the darkness, a Redeemer with magical powers is leading a company of condemned prisoners on an expedition. Will these unwilling heroes have what it takes to stand up to the hordes of evil creatures that live in the bowels of the Underworld? 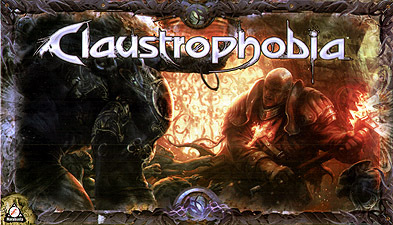 In this tactical survival game, one of the players will lead the group of humans exploring the dark tunnels of the infernal underground and fighting their way through the legions of terrifying Troglodytes. The other player is the leader of the demonic forces that are out to destroy the human adventurers. The playing board, made up of tiles that represent the tunnels and rooms of the catacombs, varies depending on the scenario. Some games will be played on a pre-defined layout, whereas other will allow the players to explore the depths of the Underworld as the game progresses.